The function columns are displayed in the Functions section of the Xsheet view. They represent the motion and rotation you applied to your drawing layer. 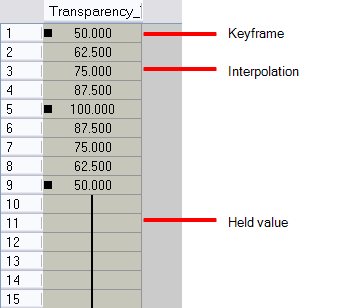 Only the function columns related to the selected layer are displayed. A function column can also be related to an effect. Selecting your effect layer shows you the corresponding function column in the Xsheet view. The function columns display the position value or effect value on each cell. If there is a keyframe on a cell, a black square is displayed. Holding the same value for several frames displays a vertical black line. Holding the same value for several frames displays a vertical black line.